What is a Compression Test and what does a Compression Tester do? Real quick, a compression test is a diagnostic procedure where you check the compression of each cylinder in an engine, which can be helpful when seeing if an engine is healthy and/or allows you to diagnose mechanical issues such as bad piston rings, damaged valves, etc. To perform a compression test, you typically disable both the fuel systems (pull the fuel pump relay, for example) and ignition systems (for older vehicles with distributors, unplug the coil, for newer vehicles, removing the coil-on-plugs will take care of it), and then you remove all of the spark plugs from the engine. Then, you screw the compression tester into the spark plug holes and crank the engine for a few seconds. Once you’ve tested all the cylinders, you’ve got all your results. Of course, don’t forget to put the vehicle all back together! 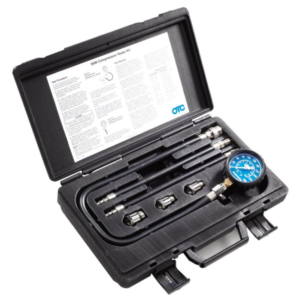 Quality tools make the job so much easier, and the OTC 5606 compression tester doesn’t disappoint. The included case doesn’t feel all that sturdy, but it does include handy instructions to help you along the process if you are new to this. Also worth noting is the instructions include a list of replacement parts you can order from OTC, in addition to a little baggy with extra o-rings and stuff. In terms of the tool itself, OTC 5606 is above average quality, feels well made in your hand, and should give you a long service life. And should you ever have a problem, it’s great that replacement parts are included and/or available, so you don’t just have to throw it away and buy another. That’s the difference between quality tools and cheap ones. The extra-long hose (two feet!) makes solo compression testing easy, since you can get the gauge portion of the tester where you can see it from inside the vehicle while cranking, a plethora of adapters allows you to test darn near any engine out there, and the large gauge is easy to read and supports up to 300psi – more than you’ll ever need on any gasoline engine you’ll encounter. The first vehicle I used this compression tester on was my 1997 Suburban, and using the OTC 5605 compression tester kit worked perfectly. I saved a ton of time using the lower quality compression tester I’d used previously, and thanks to the long hose, it was very easy to read while sitting inside the vehicle. You can buy the OTC 5606 Compression Tester Kit for about $55 on Amazon.com, which is very reasonable for the features and quality of the tool. If you’re sick of renting poor quality compression testers from the auto part store like I was, you can’t beat the OTC 5606.